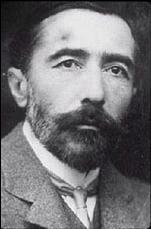 Joseph Conrad was born in 1857 in Polish Ukraine. An orphan by the age of eleven, he studied for six years at St. Petersburg University, which he abandoned before earning a degree. Conrad left Poland in 1874. He spent his next years in France, learning a second language and the fundamentals of seamanship. The friends he met there introduced him to drama, opera and theater. At the same time, he was also strengthening his maritime contacts, and soon he became an observer on pilot boats. The workers he met on the ships, as well as all his experiences there, laid the groundwork for much of the vivid detail in his novels. In the summer of 1889, while in England, Conrad began his writing career by starting his first novel, Almayer's Folly. He chose to write in English, his third language. A journey to the Congo in 1890 was Conrad's inspiration to write Heart of Darkness, his best-known work, which expressed his outrage with the practices of colonialism. He returned to England, and soon after had to deal with the death of his beloved guardian-uncle. The money left to the author gave him the financial security to make writing his occupation. Conrad's first novel was published in 1894, the same year he met Jessie George, his future wife. Subsequently, his circle of friends included contemporary authors such as Stephen Crane and Henry James. He continued writing, while traveling back to Poland and finally to America, where he remained until dying from a heart attack in 1924. The discovery of America was the occasion of the greatest outburst of cruelty and reckless greed known in history. "M. George's" life-changing meeting with Mills and Blunt at a cafe in Marseilles. Flora de Barral is the neglected daughter of a financier. She takes refuge on Captain Anthony's ship. Tells the story of Marlow, a seaman who goes into the African jungle to find a white trader named Kurtz. The memoirs of Conrad's ocean voyages. Conspiracy story surrounding an attack on the Greenwich Observatory in 1894, detailing the lives of the Professor and Verloc. A young captain listens to a stranger's story of murder in self-defense. Details the struggles of a young man's first voyage as a sea captain. The story of a the captain of a steamship who must save his ship and crew from a fierce storm. Razumov, a university student in Russia, meets Victor Haldin, a fellow student and revolutionary. When Haldin asks Razumov's help to get out of the city, Razumov turns him into the police, and Haldin is hanged. A sea story that introduces Marlowe from "Heart of Darkness."